Home / Faith / You Are a Megaphone! 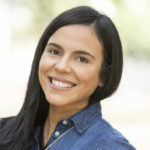 We can’t look at Bible reading like one of those television shows where each episode is completely disconnected from the other. We must approach each passage with the need to see “the previous event” if we really want to understand the plot. Today’s verses ask us to consider all that’s been written in the previous verses. 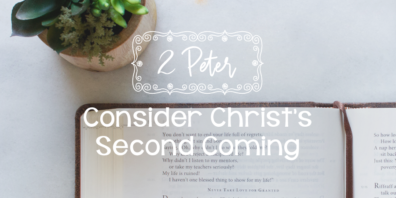 Let me challenge you to sit in a comfortable place and read from the beginning of 2 Peter all the way through 2 Peter 3:10. Did you do it? Perfect! Now let’s read the Bible together. Keep reading 2 Peter 3:11–16. We’ve written it out to make it easy. Therefore, beloved, since you are waiting for these, be diligent to be found by him without spot or blemish, and at peace. And count the patience of our Lord as salvation, just as our beloved brother Paul also wrote to you according to the wisdom given him, as he does in all his letters when he speaks in them of these matters. There are some things in them that are hard to understand, which the ignorant and unstable twist to their own destruction, as they do the other Scriptures. Peter is emphasizing his point. 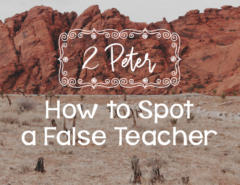 He wants to expose the false teachers who infiltrate the people of God and at the same time challenges us to grow in the knowledge of Scripture because it’s the only way to be prepared for unmasking the lie. He pushes us to strive for mercy and ends with an important reminder: Christ returns! Peter could have written this letter yesterday. His warnings and commands are timely for the time in which we live. What’s the message from the previous verses that should be clear to us? The coming of the Lord is for sure! His watch hasn’t been damaged and every day that passes from this side of the story is a sign of mercy for those who haven’t yet repented. For those of us who have believed, His return will be a glorious day, but for those who don’t, it will be a day of terror. Do you pay attention to the future? Or are you fascinated with immediate things, living only in the here and now? This kind of mentality can’t govern the life of God’s girls. 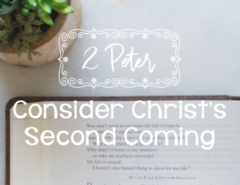 Peter clearly warned us that we should heed the promise of Christ’s return and the coming judgment, so it’s very important that you begin to live in the light of that reality. Your present needs to be molded by the future promises of the Word of God. Each day must be lived in the light of that living hope that sustains your young heart and everything you do should be focused toward God’s goal, that the ungodly repent! You may be wondering, How can I do that? Peter answers this question clearly: living in holiness and in godliness. There is no other way! To the extent that my life is different from others, I will be witnessing to those who don’t believe about the argument that governs my life: Christ is the Lord! As I strive to live a godly life, adding virtue to my faith, I’m declaring with my walk that Jesus is more glorious than any passing pleasure in the world. God can use your life as a megaphone to alert those who are running toward the flames. Everything that’s not the fruit of our holiness and devotion to Christ will be destroyed; it will be turned into ashes. The only thing that will remain will be what can be refined, not destroyed—that which has eternal value. Do you see how this is relates with chapter 1? Exercise yourselves for mercy! Be diligent in becoming a young woman characterized by her faith, integrity, love for God’s Word, endurance in the middle of a trial, self-control, and love for the family of God. Our effort is not in vain! What makes it so valuable? The eternity that awaits us; the new heavens and the new earth in which we will dwell, surrounded by complete justice. A place where we will no longer have to fight against sin, an eternal rest from the passions that fight against our soul. Doesn’t it fill you with joy to know that Jesus saved you and guarantees you a glorious eternity? That should lead us to live in a way that honors His name in all aspects, to be blameless in the eyes of God. Look forward to Christ’s coming. Desire, pray, and live to hasten it as you proclaim the gospel with your words and your life. Do you long with all your heart for the coming of Christ? 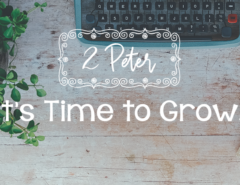 Are you striving to grow in holiness and godliness? How does the gospel give you hope? 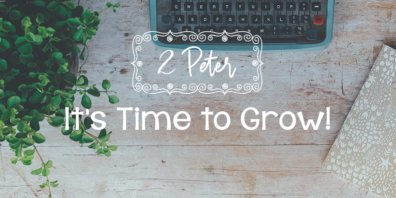 Next Article It’s Time to Grow!